These aren’t your run of the mill toasted pecans. Anyone can make those right? Let’s take it to the next level by adding in some delicious bacon and giving it a punch of black pepper. 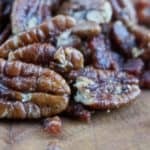 Not only will it make these even more keto friendly, but these toasted pecans will also be sure to impress your friends! While this dish is extremely simple it still provides a nice “wow factor” and lets everyone at your next dinner party know you came to play! Let’s get toasted! This recipe consists of 2 easy steps. You cook down the bacon first, getting it to 80% of the crispiness you want in the final product. Pro tip: You want to make the bacon relatively crispy, even if you are one of those weirdos that like their bacon chewy. Reason being, this dish will be served cold, and no one likes cold chewy bacon!! So, once that bacon is just about done and you have a lot of the bacon grease in your pan add in the pecans. Toss them around in the grease and let them cook. The best way to tell when they are perfectly toasted is the smell they give off. They will have a nice toasty smell. Trust me, you’ll know! It should take about 3-5 minutes on medium heat. With black pepper the flavor really changes depending on whether you add the seasoning prior to cooking, during cooking, or afterwards. The most assertive flavor comes from adding it after, and that is what I would recommend for this dish. Of course you want to go with freshly cracked pepper if you have it, and coarsely ground! Now if you want to get wild and give this dish a sweet twist you can add sugar free maple syrup! Just add 1/4 cup at the very end and cook on low heat for 1-2 minutes, making sure everything gets a little maple kiss. Show up to your next dinner party with a bowl full of this impressive combo! Heat a pan on medium heat. Add bacon and cook down until crispy. Add pecans to the pan when bacon is about 80% of the way done. Cook for 3-5 minutes. Turn the heat off and add salt and pepper to taste.